A couple of years ago, I visited Barcelona, Spain. I was lucky enough to stumble upon a jewelry gallery displaying the original gold enamel work of Masriera. 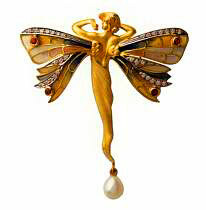 The Art Nouveau and Art Deco pieces from the late 1800’s, early 1900s were unbelievable. I’ve wanted to duplicate some of them in bead-woven pieces, but haven’t figured out exactly how to go about that. The company still exists and presents new and reproduced pieces each year. 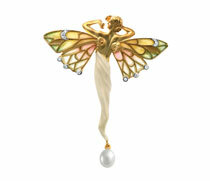 Masriera pioneered the idea that each piece of jewelry should be a miniature piece of art. 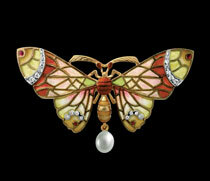 Prior to that, the primary focus of jewelry was on particular stones, cut or otherwise. 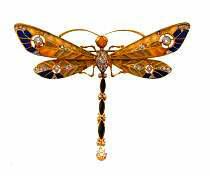 Everything else within the piece of jewelry was “frame” or “outline”. In Masriera’s pieces, the stone became part of the artistic story or presentation of the whole piece. Years ago, there was a fabulous coffee table book published about the Masriera collection. I reviewed the book at the gallery in Barcelona, but it’s been long out of print. Every year I search the used art book websites to try to secure a copy. No luck so far. 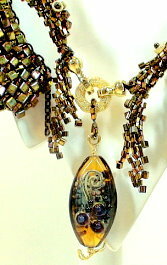 This entry was posted on March 19, 2009 at 8:45 am	and is filed under jewelry design. 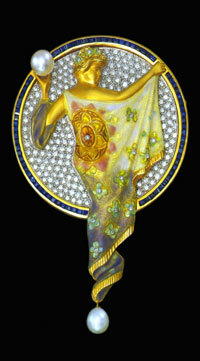 Tagged: art deco, art jewelry, art nouveau, barcelona, gold enamel, jewellery, jewelry. You can follow any responses to this entry through the RSS 2.0 feed. You can leave a response, or trackback from your own site.